Imagine if at your workplace, you had to sign up to use a computer during an allotted time in a computer lab. Sounds bizarre when you think of it in those terms, but that's the system that some say we've set up for most of our middle school and high school students who don't have access to computers in the classroom, where most of the work is done. "Computer labs are outdated, as is the idea that computers are something separate from learning, like typewriter labs," said Joel Rose, CEO of New York's School of One at the Education Nation conference in September. "Learning technology is not a vocation. Technology is not the 'it.' Technology is the fundamental enabler of education." At the Acalanes School District in the Bay Area, there are labs specifically allotted for computer-dependent classes such as video production, photography, and computer-aided design that accommodate students in those elective classes. But for teachers who want students to use computers for work in English, world languages, science, or history, there are not enough slots in the drop-in computer labs to accommodate everyone. 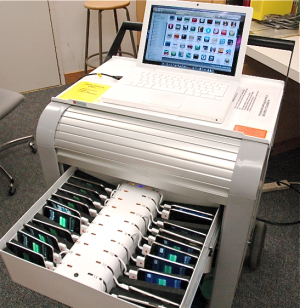 So district leaders have found a way to deliver the technology to students with the use of mobile carts. "The lab was becoming more like a classroom," says Cheryl Davis, the district's Curriculum & Instruction Technology Specialist. "With technology being used more and more -- like doing collaborative projects on Google Docs -- you had to stop everything and go 'do technology' for two periods, and there was a whole school depending on just the one lab." Now the district is using the equivalent of a mobile lab, bringing the devices to students. "It's not instant," Davis says. "They still have to be rolled over sidewalks. But it's better than saying, 'Okay, we’re going to do technology today.' That makes the use of technology inflexible, and we're trying to make it more flexible." This is a prime example of how schools are trying to update outdated infrastructure as best they can with the resources they have. "The problem for schools is that we’re in buildings that are outdated," she says. "I hope eventually it gets to the point where students all have access to the kind of technology they need for schools so they can use technology and integrate it with what’s going on in class without stopping and signing up for lab time. But I don’t know if it’ll happen in my lifetime."